VOLNOVAKHA, Ukraine—On Tuesday in this embattled front-line town in eastern Ukraine, the Ukrainian army’s 30th Brigade came under 120 mm mortar fire from its enemy—a combined force of pro-Russian separatists and Russian regulars entrenched across no man’s land about 2 kilometers away. The indirect fire skirmishes in Volnovakha underscore a more widespread surge in heavy fighting along the 250-mile-long front lines in eastern Ukraine, which began on Jan. 29. Amid the uptick in fighting, at least 35 Ukrainian soldiers and civilians have died in the last week alone. Meanwhile, Feb. 15 will mark the two-year anniversary of the Minsk II cease-fire. The conflict’s recent escalation is, therefore, a stark reminder that the cease-fire has failed, and Europe’s only ongoing land war is far from over. 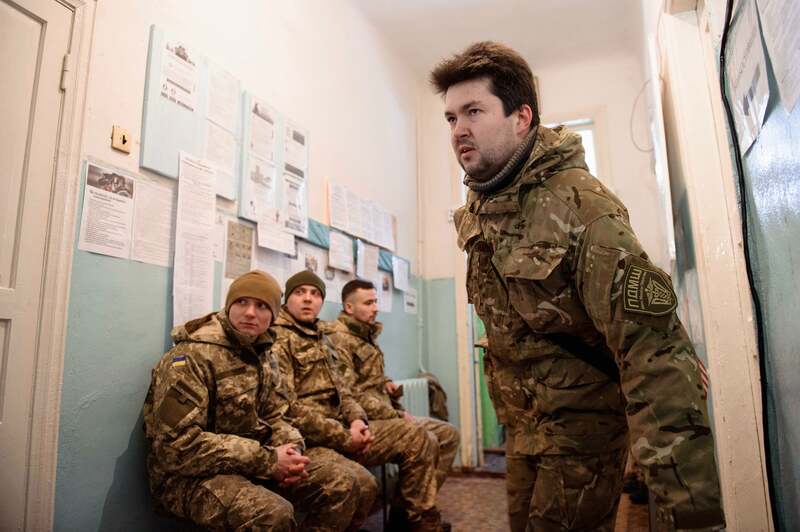 “Certainly this is still a war, Minsk doesn’t work,” Ivan Burdiuh, 31, press officer for the 30th Brigade, told The Daily Signal during an interview at a Ukrainian army position in Volnovakha. On Jan. 29, cease-fire monitors from the Organization for Security and Cooperation in Europe, or OSCE, recorded more than 11,000 cease-fire violations in eastern Ukraine. As is the case at other front-line towns in eastern Ukraine, war has become a way of life for the soldiers and civilians in Volnovakha. Despite the intermittent thunder of combat rolling in from the front lines just outside of town, life goes on. Children are still in school. City busses are still running. On this frigid winter day (wind chill dipped the temperature 26 degrees below zero Celsius), civilians and soldiers gathered at a bus stop, bundled in down and fur coats. Many wore fur ushankas on their heads. Some smoked cigarettes as they waited for a ride. Restaurants and bars are still open in Volnovakha, as are grocery stores. Yet, there are also many empty homes and buildings, abandoned, for the time being at least, by those who fled the conflict. The presence of children so close to the artillery and the snipers offers the starkest reminder of the absurd coexistence of normal life so close to the bullets and the bombs. Even for those accustomed to visiting war zones, it’s still jarring to see children walking home from school with their backpacks and lunch boxes as explosions boom in the distance. The winter weather in eastern Ukraine is deadly cold, and a blizzard on Tuesday was particularly brutal. Uncovered hands quickly went numb. The cold and the wind easily cut through layers of fleece and down. No matter how well dressed one is for the elements, time spent outdoors has to be moderated to avoid frostbite or hypothermia. The 30th Brigade deployed to Volnovakha in July. They are scattered along front-line trenches, and within earthen forts and abandoned buildings. No man’s land outside of town varies from about 2 kilometers wide to as little as 300 meters in some places. During battles, the Ukrainians claim their enemies’ tactics reveal their identities. Like at other places along the front lines, there is a daily rhythm to the fighting in Volnovakha. Daytime combat is usually limited to snipers, and small arms skirmishes, comprising machine guns and automatic grenade launchers. At night, heavier caliber weapons are more frequent. OSCE monitors do not typically work at night, however, when the majority of fighting occurs. Many Ukrainian soldiers say supplies of basic military kit and living essentials have improved since the early days of the war. Yet, civilian volunteers still meet many of the Ukrainian military’s most basic needs. Battlefield medicine is one area in which the Ukrainian military is still rebuilding itself. Today, the Ukrainian army is better equipped and trained than it was before the war. Overall, it’s now a more professional force, with a crop of enlisted soldiers and mid-level officers hardened by years of combat. 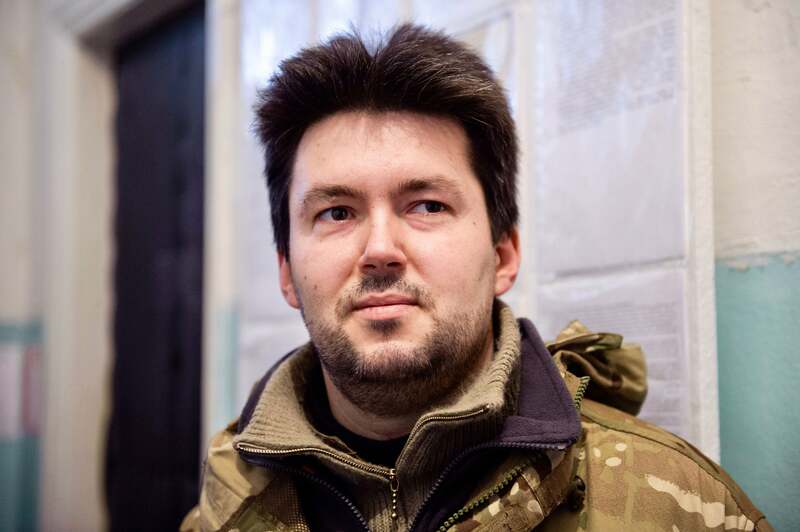 “It’s not what it should be after three years of war, but I’ve seen some progress for sure,” Pavlo Orynchak, 35, a volunteer medic working with the 30th Brigade in Volnovakha, told The Daily Signal. Some of the military aid the U.S. has provided Ukraine has made it to the front lines in Volnovakha—but not much. The 30th Brigade operates a U.S. drone called a Raven, which was part of a package of nonlethal military aid provided to Ukraine by the administration of former President Barack Obama. “It’s good, but we need more modern drones,” Burdiuh said. Most equipment shortfalls are still met by civilians. Amid Tuesday’s blizzard, Valentyn Nalyvaichenko, the former head of the Security Service of Ukraine, or SBU, and a leading anti-corruption reformer, along with members of the Justice Civil-Political Movement he heads, delivered to the 30th Brigade a portable showering module built from a converted shipping container. 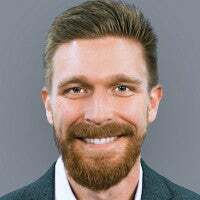 The module is modeled after modified shipping containers, called connexes, the U.S. military used in Iraq and Afghanistan for everything from living quarters to showers, bathrooms, and workspaces. The module delivered to the 30th Brigade on Tuesday is one of the first of its type in Ukraine. Funding is provided by private donations. Despite the abysmal weather, soldiers from the 30th Brigade gathered around Nalyvaichenko and his team of volunteers to offer their thanks. 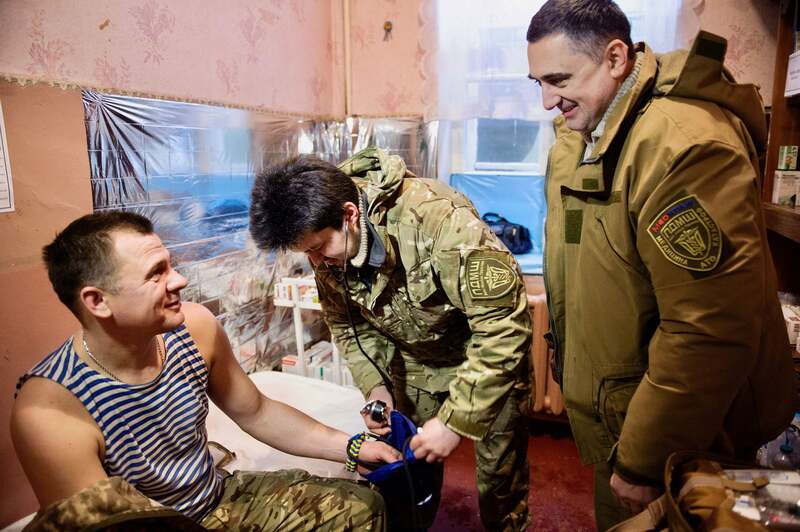 The Ukrainian troops don’t currently have hot water for showering. 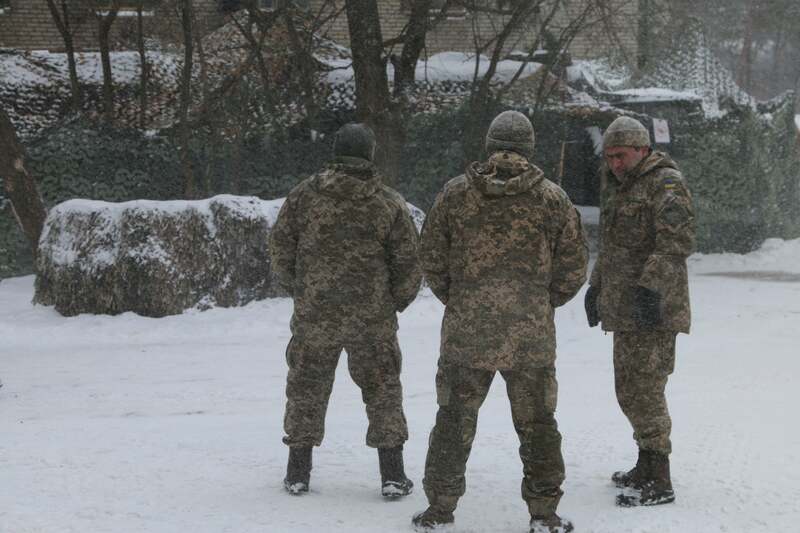 And with Ukraine’s continental winter in full force, the showering module (which has a hot water heater) is sure to make a positive impact on the soldiers’ living conditions. These kinds of volunteer initiatives also boost troops’ morale. “We feel like we owe something to all the people who support us,” Burdiuh, the 30th Brigade’s press officer, said. Before the war, Orynchak was living in the Czech Republic working in information technology. He returned to his homeland to support the February 2014 revolution. When the war began that April, he volunteered as a medic. Now, Orynchak is part of a team of volunteer civilian medics embedded within the 30th Brigade in Volnovakha called the First Mobile Volunteer Hospital. They treat wounds ranging from frostbite to artillery-amputated limbs. The volunteer medics also tend to local civilians stuck living on the front lines. The First Mobile Volunteer Hospital is entirely reliant on civilian donations, underscoring how lingering supply shortfalls within the Ukrainian military perpetuate a reliance on civilian volunteers to maintain the war effort. Zinevych is a civilian emergency room doctor from Kyiv, Ukraine’s capital. He arrived at the front on Jan. 28. The intensity of the fighting was about what Zinevych expected it would be. 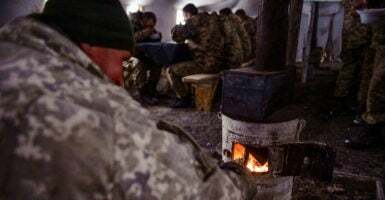 What ultimately surprised him the most, he said, was the Ukrainian soldiers’ grit amid tough living conditions and persistent combat. The recent uptick in fighting in Ukraine has centered around the front-line town of Avdiivka. Beginning Jan. 29, combined Russian-separatist forces hit the town with a barrage of artillery and rocket strikes, and infantry attacks. The fighting knocked out the town’s utilities, leaving about 20,000 civilians without power, water, or heating as temperatures dipped below minus 20 degrees Celsius. 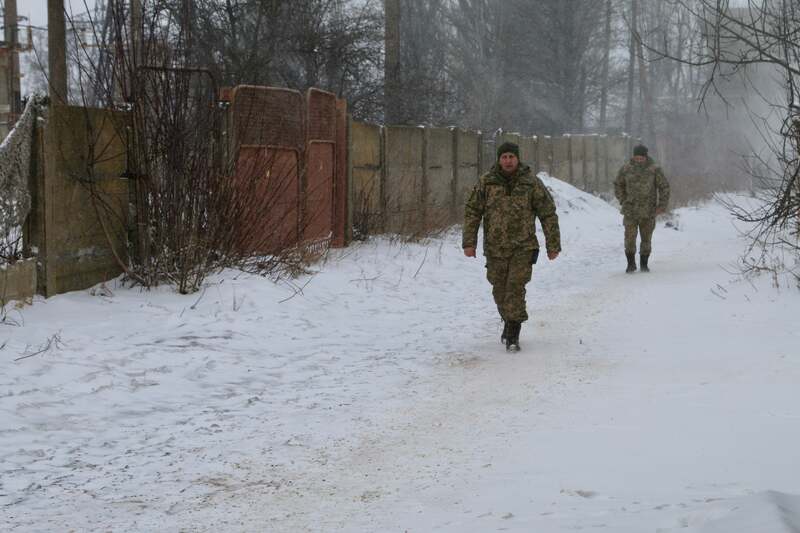 By Thursday, heavy fighting had not let up in Avdiivka. Meanwhile, 77 kilometers, or 48 miles, south of Avdiivka in Volnovakha, Ukrainian troops in the 30th Brigade reported an escalation of combat, although to a lesser degree. “They’re attacking more, but we haven’t given up any ground,” a Ukrainian commanding officer in Volnovakha told The Daily Signal. He spoke on condition of anonymity due to security concerns. Troops in the 30th Brigade said the recent surge in violence has hardened their resolve. Burdiuh said Ukrainian soldiers have already paid too high a price to consider backing down. The Minsk II cease-fire proscribes both sides from deploying heavy weapons, such as artillery of certain calibers and multiple-launch rocket systems, as well as tanks, within different minimum distances from the contact line. The peace deal also prohibits either side from taking new ground. Yet, the cease-fire never stopped the war. It only reduced it to a lower intensity as both camps dug in for a static, long-term conflict, fought from trenches, tanks, and fortified compounds along a fixed 250-mile-long front line. About 20 percent of Ukraine’s more than 3,100 military fatalities in the three-year-old war have occurred during the two years since the cease-fire went into effect. According to a Feb. 2 Ukrainian military report obtained by The Daily Signal, more than 500 Ukrainian soldiers have been killed and more than 3,000 wounded since the the Minsk II cease-fire went into effect in February 2015. Ukrainian forces in Volnovakha say combined Russian-separatist forces frequently use banned weapons and intentionally target areas where civilians live. The Daily Signal could not independently confirm reports that combined Russian-separatist forces were intentionally shelling civilian areas. To prevent collateral damage in Volnovakha, Ukrainian forces say they have repositioned their combat units away from areas where civilians might be caught in the crossfire. With fewer buildings to conceal their positions, however, Ukrainian forces are consequently more exposed and vulnerable to indirect fire. They are also more easily identified by drones, which combined Russian-separatist forces use to direct artillery and rocket attacks on Ukrainian units. Ukrainian troops insist they’re obeying the cease-fire’s rules by not retaliating with banned weapons, even after they are attacked by rockets, or artillery. “If they shoot at us with mortars, we respond with machine guns,” Burdiuh said. The Ukrainians’ lack of heavy weapons on the front line also leaves them vulnerable to being overrun in the event of a large-scale offensive. The Ukrainians have reserve forces comprising armor and heavy weapons positioned behind the front lines—according to the minimum distances delimited by the cease-fire. In the event of a massive offensive, the plan for front-line forces like the 30th Brigade in Volnovakha is to hold on for as long as they can with what weapons they have available while reserve forces race to the front lines to provide lifesaving relief. The Ukrainian forces hold exercises to practice rapidly deploying reserve forces to the front lines. The majority of Ukrainian troops say they’re fighting against Russia for their country’s independence. They push back against labeling the conflict a “civil war,” pointing to Russia’s hand in the conflict as evidence that Ukraine is locked in existential fight for its freedom from Moscow. The pro-Russian separatists they are fighting against, the Ukrainian troops say, are nothing more than proxy forces in a larger Russian war against Ukraine. Burdiuh, who is married but has no children, said his dream after the war is to become a father and travel the world with his wife. “It’s my dream to go the USA,” he said.